With the current run of school jew in the river systems of the Sunshine Coast, it is well worth grabbing your rod and heading out on the water to chase them. School jew are just juvenile jew ranging between 2 and 5kg. The school jew actually congregate in small schools as their common name suggest. This allows anglers to capture them in good numbers, but make sure that you only keep your bag limit of 2 fish per angler and that your fish are 75cm or longer before you keep them. When releasing fish make sure that you support them with two hands when holding them up for a photo and placing them back in the water. The tackle required to target school jew can be a lot lighter than that used for big jewies. Anglers can get away with using 6-15lb line on a lighter action rod, but will still require 15-40lb mono leader material to cope with the fish’s teeth and the snaggy terrain in which the they feed. These fish still feed in all the usual jew haunts, which tend to include deep holes and channels, rocky ledges and walls, bridge pylons as well as areas that hold good numbers of bait fish. Like all jew fishing, it is best to target school jew at night, because this is when they feed the most. Tides and moon phases will affect their feeding patterns as well. I have found that one hour either side of the high and low tides are best. Several days either side of the new and full moon is a rough guide of when to try. Noosa River: Noosa Sound, around Munna Bridge, Woods Bay, Weyba Creek and the ski boat run at Tewantin. The Noosa river in particular Weyba creek holds a lot of prawns that provide food for school jew. Both entrances to the canals systems are the Woods bay and Munna Point area fish well as the prawns move out of the system with the tide. Live prawns, prawn star lures and most other soft plastics prawns or shrimps work well. Maroochy River: The cod hole, out from Yinni Street, the channel running under Bli Bli bridge and around the mouth of Coolum Creek. Drifting soft plastics through the deeper channels when the tide works well. The 4” powerbaits have proven particularly popular. Large live herring, gar and poddy mullet are good live bait and these fish also love heaped live sands worms too. Mooloolah River: The channel that runs under McKenzies Bridge, all the cannels and at the entrance to Parrearra Channel are the best. Deep water, rocky structures and the ability to hold a lot of bait that jew feed on are the key features in the Mooloolah. Pummicestone Passage: The Caloundra bar, Pelican waters Canals, the channels between the mouth of Bells and Coochin creek have fished really well this year. The best bait by far has been locally caught squid about 4-6” in length. 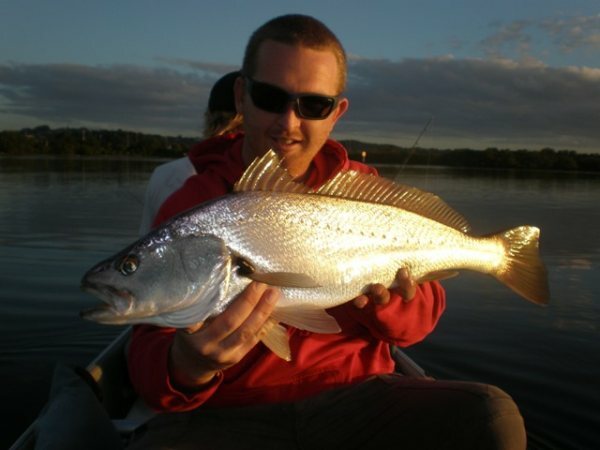 Noosa: Dart, whiting and bream along Sunshine and Peregian Beaches. Tailor from Marcus Beach. Bream and tailor from the river mouth through to Teewah. Tailor to 3kg on the beach near Double Island Point and jew off the rocks. Trevally in Woods Bay and the Sound. Flathead from Noosa Harbour. School jew above the ski run. Luderick off the rock walls at the river mouth. 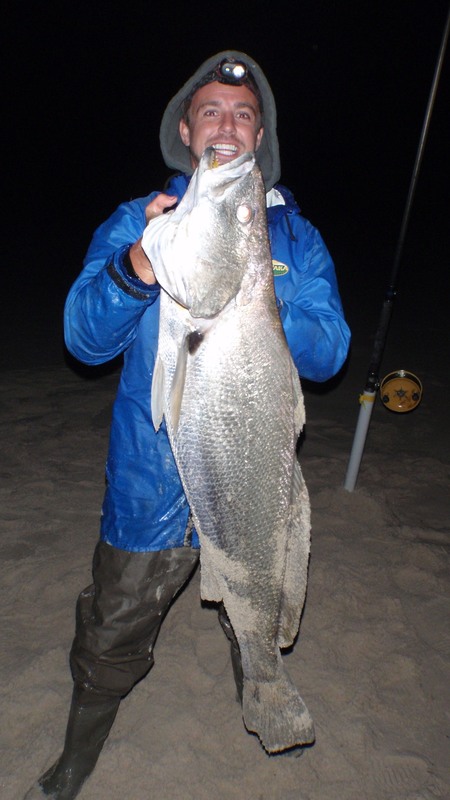 Maroochydore: Jewfish to 86cm at night on live Bait at the Cod Hole. Chopper tailor from the sand bags. Flathead and Bream around the Bli Bli flats through to Coolum Creek. Whiting around Goat and Channel Island. Kawana: Spotty and School Mackerel have been taken on the troll around Point Cartwright. Bream, Tarwhine and Chopper Tailor along Kawana Beach. Flathead and Trevally at McKenzie’s bridge. Gar from La Balsa Park to the Sand Basin. Caloundra: Tailor around Happy Valley and the N.E tip of Bribe Island. 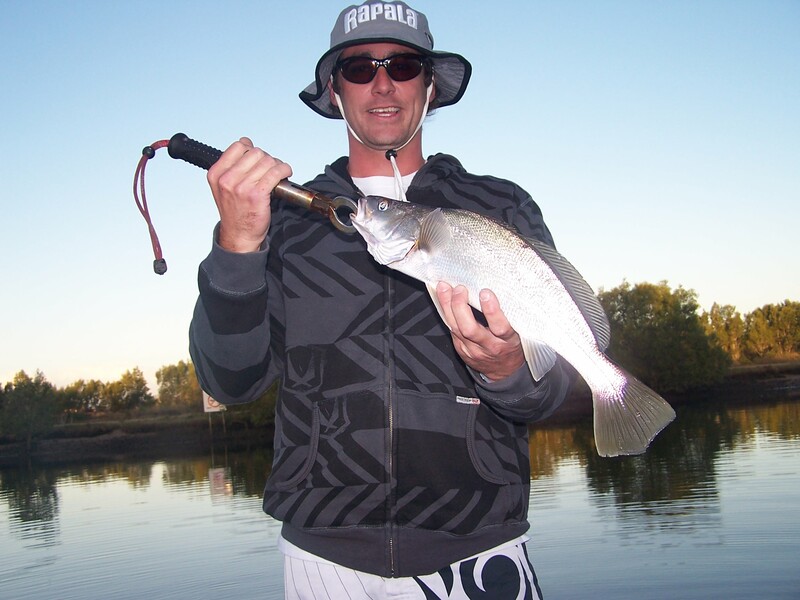 Trevally on lures around Pelican Waters Canals. Bream and Flathead from the Blue Hole to the Power Boat club. Good numbers of Luderick off the boardwalk. Jew of 17kg aren’t uncommon on Sunshine Coast Beach, but they require a lot of time and effort to catch. Pete Murray caught this whopper off North Shore on a recent overnight trip using mullet fillet. Brett was drifting in the middle reaches of the Maroochy River using soft Plastics aboard an Anglers Advantage Charter when he caught and released this school jew. Bryan was working plastics plastics in the upper reaches when he caught and released this 65m school jew using 4lb braid.